It was rather windy this evening so no doubt I will acquire better images in the future. Still I was rather happy with the results, especially the global mosaic which looks sharp despite the wind. 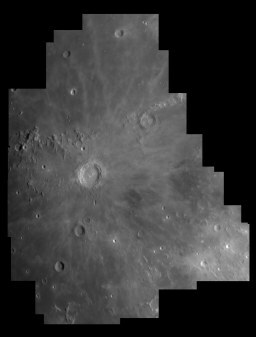 A mosaic of the Moon at f/6 on 1 February 2004 near 23:30. Click the image for the full size version. A mosaic of Copernicus and surrounding areas on 1 February 2004 near 22:30 UTC. I used a Tele Vue 5x Powermate for getting the focal ratio to f/30. 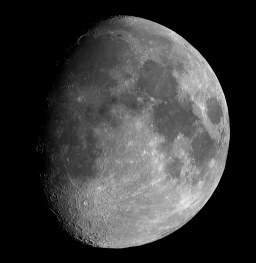 Image acquisition took roughly 90 minutes due to my lack of experience and lack of familiarity with the Moon at the high 'magnification' I was using. Click the image for the full size version.